We process Kodachrome film as Black & White negatives, since the color slide chemicals are no longer available. The negatives are usually very dense and are low in contrast. We optimize the contrast and brightness of each image to make a 4x6" Black & White Lustre print and save the improved images onto a CD. 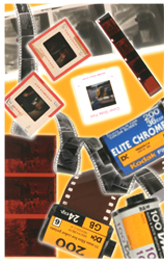 Only about 40% of Kodachrome films have any printable images. Price includes prints and scans. Minimum Charge: $9.95 if film has no printable images. We are happy to offer any of our processes as mail in services. Click Here for our standard order form, or call toll-free 800-793-0112 for more information.